Happy Sunday Everyone! It's challenge day over at Birthday Sundaes. For this week's challenge it's anything goes. 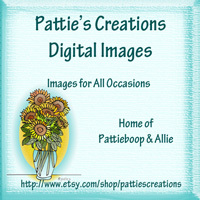 This week we are sponsored by Pattie's Creations. For my project, I used the Just a Note cartridge, which is installed in the Cricut Expression 2 machine. I hope to see over at Birthday Sundaes. Your card is so fun. I have this cart but haven't had a chance to play with it yet. Thanks for the inspiration. I love the design of this card! It is so cute!